Whether you are looking to bring your A-game indoors or simply trying to find a way to entertain yourself, you really can’t go wrong by choosing an indoor basketball hoop. Miniature basketball hoops are a great way of practicing your hand-eye coördination, blow off steam, and even getting your kids into sports early. In this review, we will show you the best mini basketball hoops that are currently available on the market. These products are highly rated among many customers as each product comes with useful features and benefits for any basketball fanatic. Rated as one of the best mini basketball hoop, this miniature basketball hoop by SKLZ is available in two sizes – Standard 18×12” and X-Large 23×16”. The Pro mini offers a 9”diameter spring-action steel rim with a shatter-proof polycarbonate backboard. This model also has a 3-ply, 8-loop nylon net to replicate the look of a professional basketball net. With the SKLZ Pro mini hoop, you have the option of attaching the hoop directly to your door with the use of foam padding backing and hoops or attach the hoop directly to your wall. However, the wall mounting hardware sold separately. The SKLZ Pro Mini Hoop is also available in Classic , Glow in the dark and Pro Mini Micro. While this hoop set does require a bit of assembly, its durable material will stand up to even the hardest dunks and leave you with hours of enjoyment. When it comes to sports equipment, you can never go wrong with Spalding – the largest basketball equipment supplier that is sold worldwide. 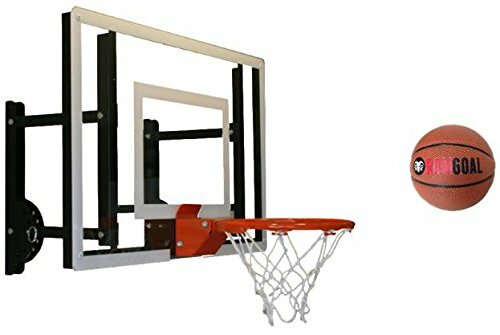 The Slam Jam Over-The-Door mini basketball hoop is constructed out of steel in an 18 x 10.5-inch polycarbonate background frame. This particular mini hoop was designed as a 1/4” scale replica of the Official NBA court backboard. A 4” hard rubber basketball is also designed after the balls used in the NBA. This set provides a breakaway rim that is designed to withstand hard dunks and protect your doorway from damage. While it does not offer a bracket to mount on the wall, this could easily be achieved with a drill and a couple of screws. 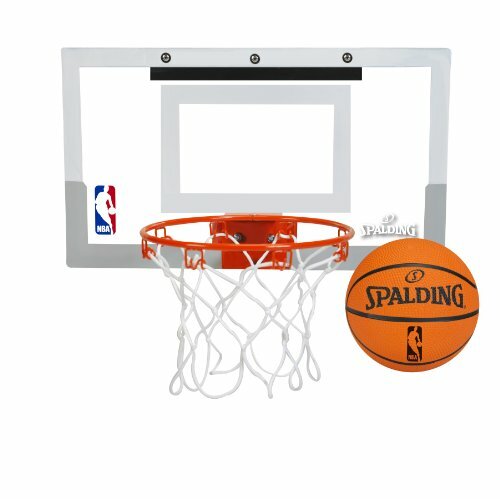 If you’re looking for a smaller Spalding option and want to support your favorite time, check out the Spalding NBA Mini Hoop Set. 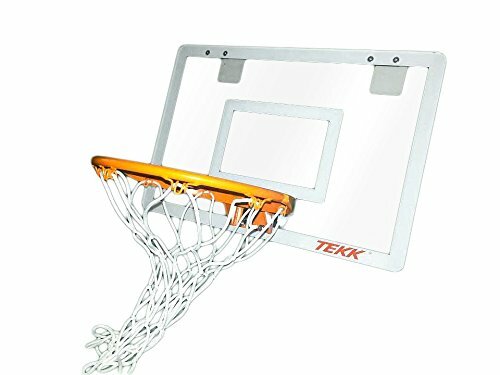 Rated as one of the most durable and strongest mini hoops on the market, the Tekk Nate Robinson Monster Jam Mini Hoop offers a ¼” polycarbonate shatterproof backboard that is twice as thick as other mini hoop backboards. It is constructed with a solid steel spring-loaded pro rim that is identical to the equipment being used at College/Professional level basketball. This hoop set comes with a 5” high-grade rubber basketball, a pump and a 1-year warranty. It’s easy to install over the door or on the wall. However, the wall-mounting hardware is not included. Sport your favorite basketball team with this NBA-licensed professional-grade indoor basketball hoop. 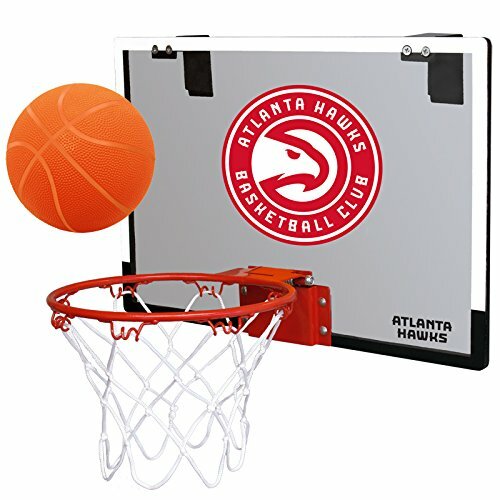 It features an 18×12” polycarbonate backboard frame with your favorite team logo printed on the front. It has detachable unique breakaway 8” diameter metal rim that can be removed with ease. The backboard is easy to assemble and can be mounted over the door with padded hooks or hooked to a wall for a more permanent fixing. This indoor hoop set comes with an inflatable 5-inch ball. However, buyers mentioned that the ball is too hard and that there is no pump. It also is low-maintenance and suitable for all age groups. 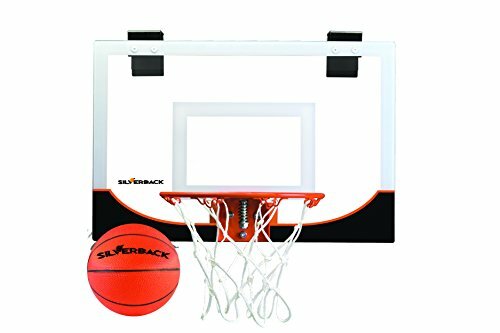 Get more shooting time with this mini basketball hoop, as the Silverback basketball mini hoop is rated high for its great performance. 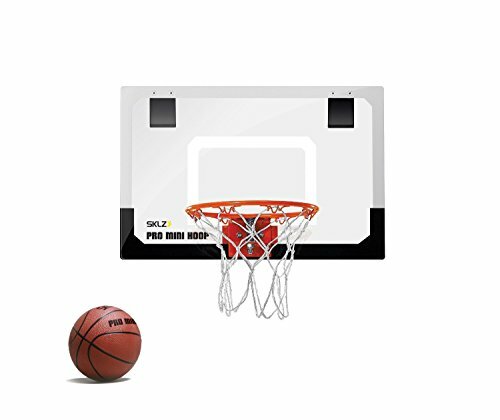 This mini hoop has a 23 x 16” clear polycarbonate shutter proof backboard made of durable and strong materials. It features a spring action breakaway rim and extended bracket design that’s great for a durable, indoor enjoyment. It’s fitted mounting system allows a quick and easy installation and removal when not being used. This will save you the hassle of having somebody else to install it for you. 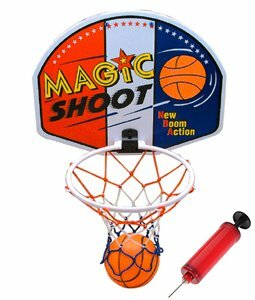 Considered as one of the best mini basketball hoops being sold worldwide within its price range, the Magic Shot Mini Hoop offers a 13 x 16” plastic backboard with a 9”diameter hoop. This lightweight model is the most budget-friendly option on the list that will provide the same amount of enjoyment when in use. The set includes a 4.5” rubber basketball, foldable rim, multi-colored net, ball, and pump. It is easy to assemble and gives you the option of mounting on the wall or use over the door as it comes with an over-the-door mounting bracket. With an average 5-star rating, the RAMgoal Hoop provides a built-in adjustable mini hoop of up to 13 inches. It offers a 24×16” acrylic shatter resistant backboard with 16 gauge powder coated steel. The RAMgoal indoor mini hoop comes with a 5”diameter Synthetic leather mini basketball. This set is ideal for all ages as the breakaway rim allows for more strength and durability than any other mini hoop in the market today. With the RAMgoal mini basketball hoop set, you won’t have to worry about damaged walls, a broken backboard or a broken rim. Another great option to consider is the Wall Mounted Mini Basketball Hoop – Mini Pro 2.0 for a high-quality indoor mini hoop that any NBA fan will enjoy. As a result, the RAMgoal Durable Adjustable Indoor Mini Basketball Hoop is definitely a great compromise to a professional basketball hoop. It would make a great gift for any NBA fan. If you’re looking for a great hoop that’s in between Premium quality and budget-friendly, the SKLZ Pro Mini Basketball Hoop offers a little more variety as it comes in two sizes and features a realistic net and rugged construction. By combining realistic experience indoors with options in location and size, SKLZ Pro Mini Basketball Hoop is definitely a great choice to consider. The above Basketball hoops will help you evaluate and find the best mini hoop you need to help you stay active, even indoors.